Hey everyone! Last week I was a ball of nerves. I flipped back and forth between “Yes, I’m doing this thing!” and “Why am I doing this?!”. I almost talked myself out of doing it. 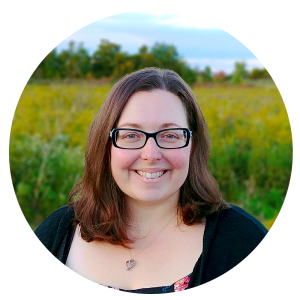 When I hit post and shared my post on social media, I was a nervous wreck. But it was out there now and what would happen would happen. I added the pattern to Ravelry and I went to play with the kids to distract myself from the sinking feeling of knowing that my blog was out there and I’d told people about it. Ten minutes later, my phone started buzzing. People were liking and commenting on my posts. Everyone was so nice! Soon there were dozens of comments and people were private messaging me with questions and nice comments on my Arctic Gem Beanie pattern. I was so overwhelmed by the response. By the end of the day over 1200 people had visited my first blog post and I was blown away. This kind of response was the last thing that I expected. Thank you to everyone that took the time stop by and check it out, subscribed, and sent me such warm, encouraging comments. You all seriously made my day. Some of you were sending me messages like “I love it and it’s already on my hook!”. You guys work so fast! By the end of the day, people were sending me pictures of their already completed hats! Please keep sending me your pictures and sharing it on social media. I love seeing everyone’s finished work and how some of you are changing the colours up and really making it your own. 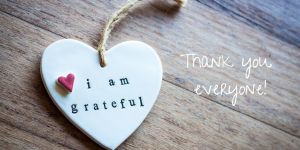 I wanted to thank you everyone for reminding me what a wonderful community of crafters you all are and for supporting me in this crazy adventure. As I was standing in the line at Michaels (yes, they probably all know my name by now), I saw this weird and cute sloth pencil case. Inspiration hit me! 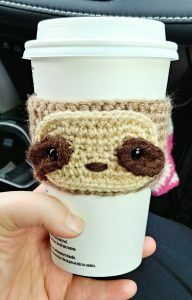 I would make a sloth coffee cup cozy. Sloths are crazy adorable AND the colours may not show the coffee stains as readily (because, I’ll admit it, I AM a clutz). 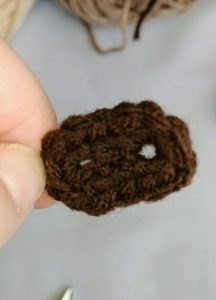 I already had the yarn I needed at home so I cashed out and with visions of how I would execute my pattern in my head, I hit the Tim Horton’s drive-thru and went home. This little guy doesn’t take long at all to make and is very cute. Since I’m Canadian, I’ve made the pattern to fit a large coffee from Tim Hortons. The body of the sleeve can easily be adjusted to fit whichever cup you’re using, just make the chain as long or as short as you need it to be. 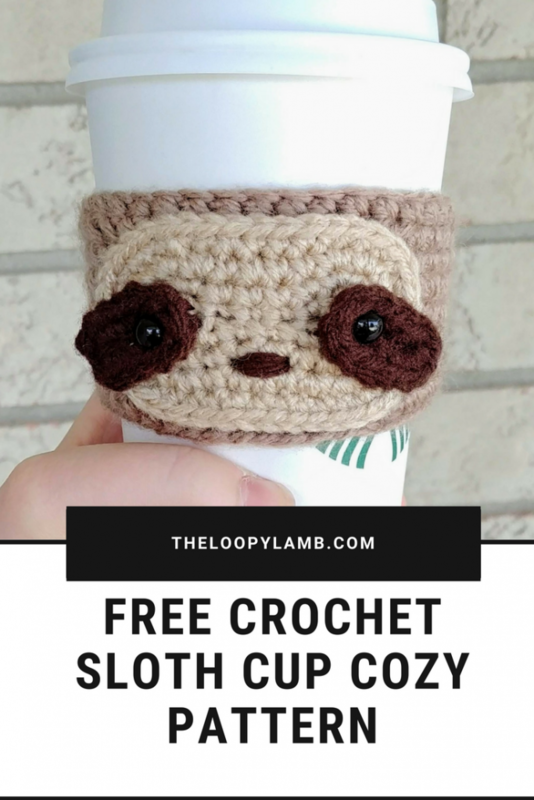 With that being said, let’s hook us up a sloth cup cozy! short as you need it to be. Using Cafe au Lait, CH 35 and join with a sl st.
Row 2 – 8: CH1. HDC in the first stitch and in each stich around. Join with a sl st. The Face is worked in continuous rounds. Only join where indicated. Row 4: SC in each stitch around. 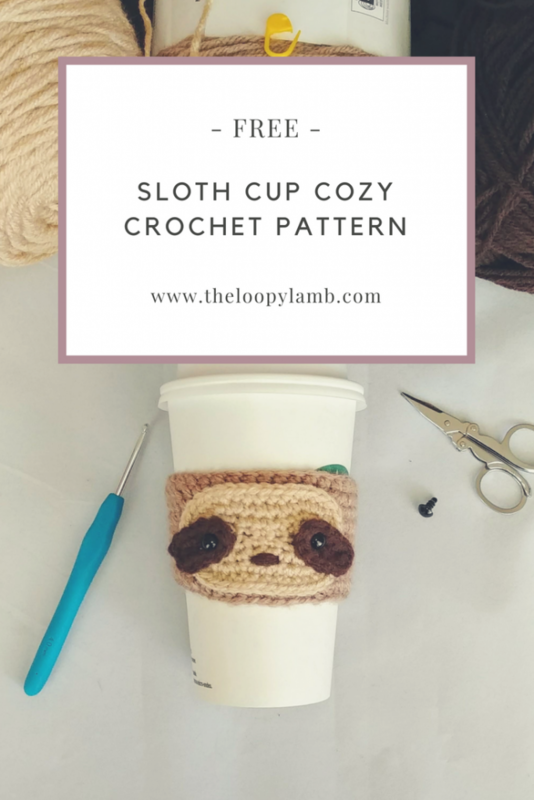 Join with a sl st and FO leaving a long tail to set onto the coffee cozy body. Row 1: SCINC in the 2nd CH from the hook. SC, SC5 in the last CH. On the other side of the CH, SC in the next stitch, SC3 in the last CH. Join with a sl st and FO leaving a long tail to sew onto the face. Sew the face onto the cup cozy body. Position each eye patch on the face, slightly overlapping the edge of the face and sew onto cup cozy. Using dark brown, add a small nose between the eyes. 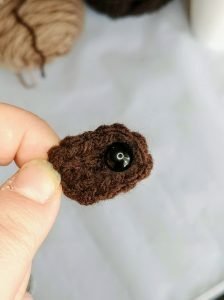 If you’re using safety eyes: I had the hardest time finding black shank buttons so for my first cozy, I used safety eyes. I know that sounds crazy but I’ll tell you how I did it. Insert the safety eye through the last CH in the eye patch. Then position your eye patch at a slight angle on one side and push the safety eye through the face. Put the back on the eye . Repeat with the other eye and eye patch. 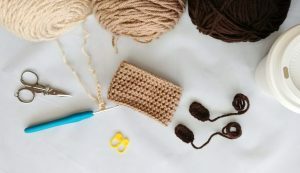 Use the dark brown yarn to add a nose between the eyes. Then sew the face onto the body of the coffee cozy. If you enjoyed this pattern, please pin it and share it. I love seeing pictures of your completed projects! Use the tag #theloopylamb when sharing on Instagram. Got questions? Drop me a comment below and I’ll do what I can to help! I’d love to see your finished items! Please share your finished makes by tagging the pattern on Ravelry, sharing it to our Facebook page or Instagram! Use #theloopylamb when sharing on Instagram.